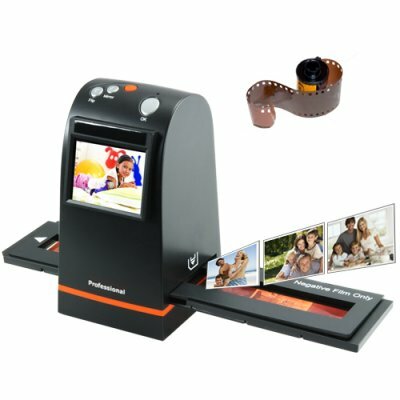 Successfully Added 35mm Film Scanner with LCD + SD Slot (High Resolution Model) to your Shopping Cart. Introducing our top of the line 35 mm film scanner, the G284. Featuring a 9 megapixel image sensor for the most accurate photo reproduction of any film scanner in its class. This is the upgraded model of our popular CVKB-G111 film scanner, and features an impressive capture resolution of 3696 x 2464! This high resolution film scanner is designed to work with 35mm negatives, slides and roll film. It lets you turn your old 35mm film into modern digital photos and can be used independently of a computer thanks to the built in SD card slot. Instead of taking those old 35mm slides and negatives and paying $2 each to have them scanned by the local shop, now you can do it yourself for a fraction of the cost! Whether you need to give some archived photos to a business client or to your family members, in less than 4 seconds per picture, you can turn any old 35mm photo into a 9MP 3696 x 2464 rich color image! There is an additional benefit of using the G284 to digitize those old photos - safety. If you lost those old 35mm photos due to fire, theft, or simple age decomposition, they are lost forever, which would be devastating. However, once you digitize them into JPG files they can be copied, moved, duplicated freely with a simple click of a mouse. This is really a small investment in both convenience and safety for all those irreplaceable photos. The new G284 35mm Film Scanner with LCD and SD Card Slot simply is the best way to turn your old roll film, slides and negatives into new photos. It is in stock in our warehouse right now for single piece or bulk stock orders. From the leader in direct from China electronics, Chinavasion. NO. This is designed as a standalone product and saves the scanned images as JPG files onto your inserted SD card. You can expect each photo to be roughly 2.5MB in size so about 3,200 photos. I just received this film scanner and I am impress. The quality of material are quite good, the scan is fast (aprox 1-2 second for 1 slide) the picture quality is more than I expected. For this money I can say that it's worth and you can scan your films with good results. This is a excellent scanner and the quallity of the final product is better than the photo itself. Also a great investment which will last you a very long time. Also great to generate an extra income. I got the 35mm Film Scanner, it's a fantastic product that makes "magic' with my old 35mm films negatives, Work's great I like this product, because I got a very old negatives that I left them in a drawer for a long time, and because of this great product I got my memories back, I can enjoy see them, like I took them now,I recommended this 35mm Film Scanner with LCD + SD Slot (High Resolution Model),Especially if you have memories on a negatives and you lost or damage the photos,with this great product you can bring them to life and can enjoy them. I like to order from chinavasion because they got a good product. Thanks to you GREAT people of chinavasion and for the good service I got THANKS.